Time lock is one kind of combination lock which use a clock mechanism to secure a safe. This idea became common after 40 years of its first English patent in 1831. 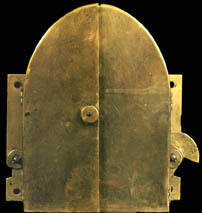 Early bankers were justifiably concerned about the reliability of a lock that barred entry by friend and foe alike, it is because a failed time lock will cost a lot - requiring the destruction of the safe. By the 1860s, advances in watch and clock technology had made the mechanisms very reliable while the safe became unsafe. More and more burglars kidnapped the bank employees in order to get the keys, passwords or combinations. Therefore, bankers started counting on the time lock and its innovation and improvement began. In 1872, John Burge, a physician in Circleville, Ohio, designed the Gothic time lock. The idea for a combination of a timer and a lock can be be dated to at least 1831. 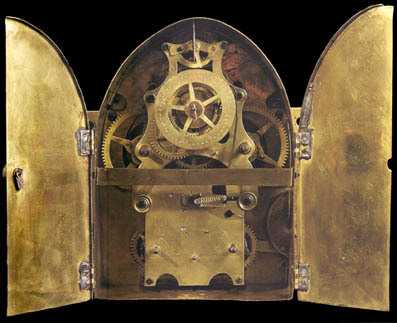 However, by the time John Burge asked the famed clock maker Laporte Hubbell to construct the fully functional model of his Gothic Time Lock in the early 1870s, the idea of time lock became the last and possibly the most important major development in bank security for the next 100 years. John Burge's Gothic Time Lock was replete with features, including 2 independent power springs, a reliable marine chronometer movement, and a powered rotation bolt. The broad-rimmed central dial indicated the time before unlocking, 0 - 48 hours. If you would like to know more about Time Lock, this is a nice book. The photos are big, sharp and clear.